Now a discussion arose between some of John’s disciples and a Jew over purification. And they came to John and said to him, “Rabbi, he who was with you across the Jordan, to whom you bore witness—look, he is baptizing, and all are going to him.” John answered, “A person cannot receive even one thing unless it is given him from heaven. You yourselves bear me witness, that I said, ‘I am not the Christ, but I have been sent before him.’ The one who has the bride is the bridegroom. The friend of the bridegroom, who stands and hears him, rejoices greatly at the bridegroom’s voice. Therefore this joy of mine is now complete. He must increase, but I must decrease. Being a groomsman has sacred significance. The bride and groom are asking you to be witnesses of a covenant before God and to hold them accountable to it. 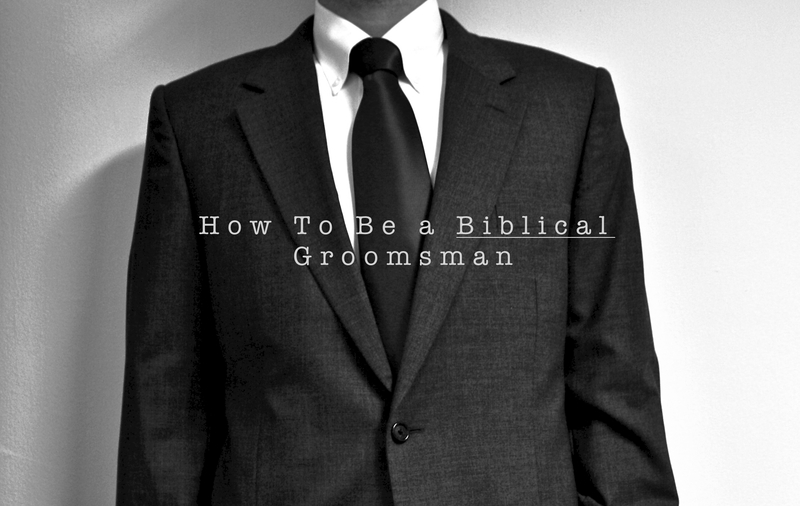 So, how can you glorify God and love the groom while being a part of his wedding party? As John thinks about his ministry success preparing the way for Christ, he does not seek to keep it; rather, he acknowledges that his ministry was a gift from God. In the same way, groomsmen ought to recognize the gift that their dear brother has been to them, and thank God for it joyfully. Don’t spend the bachelor party, rehearsal dinner, and wedding thinking about how you’re losing a friend to marriage; instead, rejoice for the gift of friendship. In the same way that John recognized that, “The one who has the bride is the bridegroom” we ought to recognize that this marriage is not about us. Rather, we should spend our time before, during, and after the wedding lifting up the meaning of marriage. In the dressing room before the wedding let the stories of good times and belly laughs abound, but our primary role is to remind the groom of Christ and highlight the weight of marriage. John says that he, “rejoices greatly at the bridegrooms voice. Therefore, this joy of mine is complete” In the same way, let the tears fill your eyes when your brother sees his bride for the first time walking down that aisle and his jaw drops a bit. He is not thinking about you. As a matter of fact, he probably has forgotten that you exist. He is loving his bride. His heart is filling with joy. And as his heart fills with joy, yours should as well. It is our great joy to share in one of the clearest human expressions of the gospel outside of the spoken word. Let the weight of standing to the side hit us; and let us all – groomsmen, bridesmaids, bride and groom – decrease so that He may increase. I love this, I am doing research on this .. Thank you.